Product code: ES7725 Categories: Antique, Necklace. 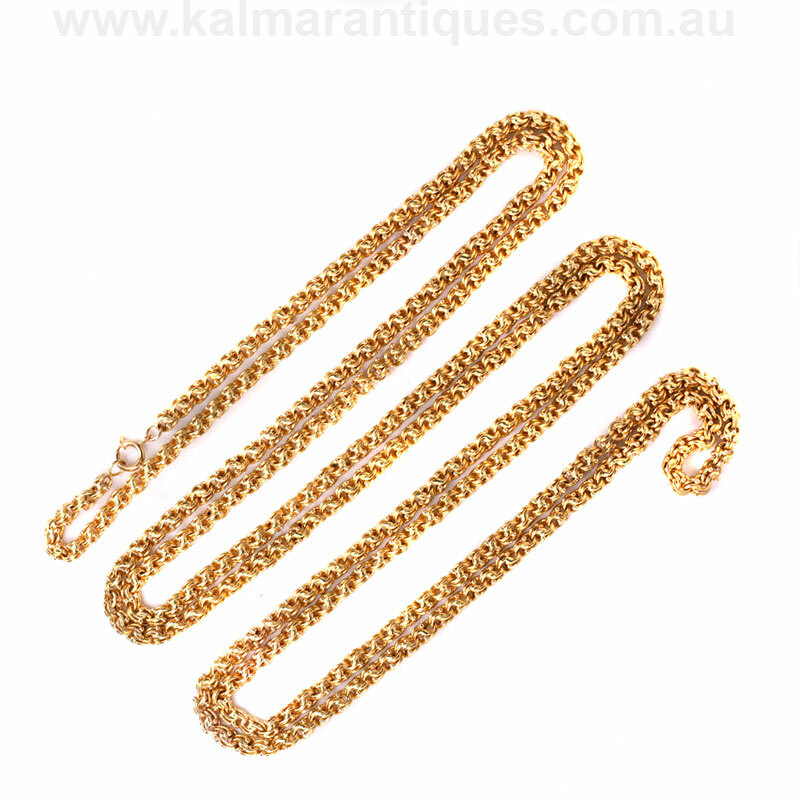 Guard chains were made and designed for women to wear around her neck with her fob watch attached and were popular in the 19th century, and here is an incredibly rare solid 22 carat antique guard chain measuring 195cm in length, or 6 foot 4 inches when laid out end to end. Entirely hand made, the time needed to make nearly 2 meters of chain in solid gold would have been immense and this one is so beautifully and uniquely designed and measures 5.6mm in diameter. This chain has such a tactile feel to it and can so easily be worn long, doubled or even tripled over, and no matter how you choose to wear it, there is no doubt that it will always be admired and looked upon with awe. Bearing hallmarks for Portugal, if this piece could talk it would be amazing to consider who owned and wore such a magnificent piece of high end jewellery all those years ago. Antique guard chains are around today and make such a versatile style, however there will be little to compare this to it regards to thickness, link design, length and high carat of gold which is practically unheard of with antique guard chains. A truly spectacular and unique piece. Guard chains were originally designed for a woman to wear around her neck with her fob watch attached. Muff chains followed the same principle and were designed to attach the woolen muff to, so when the lady went inside, she could remove her hands from the muff. This amazing antique guard chain was made in Portugal in the 1800’s and measures an astonishing 195cm (6ft 4″). Made in solid 22 carat gold, it was hand made and truly like no other.